Martha, Martha, Martha. I admire your cookery and your craftiness. You make it look so easy. Like anyone can do it. But can they? I've tried some of your projects with varied success. So, dear Martha, I'm going to post some of my attempts here on book-a-rama. 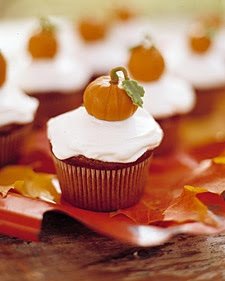 First up is Pumpkin Patch Cupcakes from Martha Stewart's Cupcake book. I didn't make the cream cheese frosting because my girl hates it, nor did I make those cute little pumpkins. It took me hours just to do this. Also after about a day, the food colouring started to run. But they were delicious! And the recipe made a huge amount. I put some in the freezer for my girl's class Halloween party (without the icing). Stay tuned for more Chris vs Martha! I actually like your cupcakes better - that little pumpkin thing on the top of Martha's does nothing for me. Both look delicious to me! Like Kathy, I think yours look more yummy! Yours look tasty...and I like the purply frosting much better than boring ol' white. And anyways, as long as they taste good, who cares what they look like! Whoa...Martha's got nothing on you!!! I had to do a double take to check to see if I had the pictures right, because honestly, yours look sooo much better to me! Ha! I love this segment. I agree that I like yours better. I wouldn't know how to eat Martha's without looking like a slob. I agree with everyone above, yours look better. For one thing, I hate cream cheese icing, for another your icing just looks so much more Halloween-y. Hers look like they should be for Thanksgiving. Anyone who doesn't want the cream cheese icing can pass it my way! While Martha's look very pretty, your look very much like something I'd be happy to take a huge mouthful on! Thank you all for the compliments! If I can do it, anyone can. Meghan & Marg- I like cream cheese icing too, unfortunately my child does not. Go ahead; put Martha out of business. I like you much better (and wow -- the Chris cupcakes win, no contest). Martha who? She's got nothin' on you!! Your cupcakes look so good!!! They look great, bet they were yummy! I put the cupcake book on my Christmas list so hopefully will be trying the out soon too! I really like your version, although I would like to see minature pumpkins on top of them (just so cute). The blue frosting looks like denim-- cool!